Students at Wits University reacted ambivalently to the idea of volunteerism as they passed the many tables of non-government organisations (NGOs), on the library lawns today. 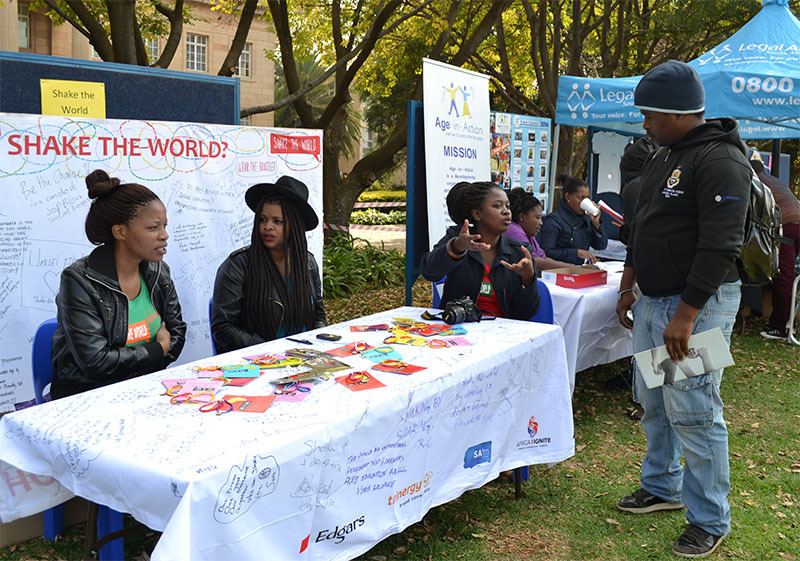 The NGO fair staged by the Wits Citizenship Community Outreach (WCCO) was part of a drive to recruit more volunteers and create awareness of the 50 projects represented. But attracting students as volunteers as easier said than done, according to Thoriso Moseneke, assistant manager at the WCCO. “We have a Facebook and Twitter page to engage with students, but they don’t engage with us,” said Moseneke. Lack of a volunteer spirit? “I like volunteering, I used to do it in high school. I stopped because when you write volunteering on your CV, potential employers will think you are wasting your time, it looks like you have time to waste on volunteering,” believes Mary-Joy Dikgale, 1st year BEd. To address the negative perceptions of volunteering, the WCCO, formerly known as the Wits Volunteers Program (WVP), changed its name at the beginning of this year to move away from the “charity model” and develop a more citizenship-centred approach. “We felt that volunteerism gives people a choice and we felt we needed to instill more of a responsibility in students to do more for their community,” said Karuna Singh, manager of WCCO. WCCO wants to break the perception that volunteering only involves helping poor people and aims to get students involved in helping the Wits community and their communities at home, according to Moseneke. People have different perceptions of giving and think it only involves money, added Yolanda Kupa, 3rd year BSc Chemical engineering and volunteer. “People want to make a difference but are not patient in seeing it through, especially in long term projects,” said Zukiswa White, 3rd year BA Law and volunteer for tutoring project ASSIST. She says people get discouraged easily when they cannot see the difference they are making. People have an attitude that volunteering is a “favour” and not a citizen “responsibility”. “Social justice and community work is not just charity or something to put on your CV,” she said. Other students have had positive experiences with the volunteering programs in which they are involved. “Volunteering has enriched my life and given me a social conscience. It has shown me my immense privilege,” said Bandile Ngidi, representative of Young Economists for Africa and Masters in Economics student. Rukudzo Pamacheche, who tutors accounting, turned down a paid tutoring job to volunteer instead, saying that she is glad she can “deliver some knowledge in a different way students can understand”. NGOs present at the fair included various tutoring programs, animal-aid, children’s homes and the Diary of Esther project, which collects sanitary towels and toiletries for girls.